Thursday, September 1, 2016 — Do you burst into tears for seemingly no reason, snap at those closest to you and generally feel moody, sometimes angry and just plain "out of sorts"? While stress, mood swings and low energy have become accepted symptoms of modern living for most women, there is a natural remedy that has helped thousands balance their hormones and take control of their lives. Formulated 15 years ago by naturopath Dr Jeff Butterworth for Australian Olympic gold medallist Lisa Curry Kenny, 30 Plus® NuWoman® is an all-natural daily supplement designed to help women suffering from hormonal imbalance symptoms that can disrupt quality of life and lead to symptoms such as mood swings, stress, irritability and lack of energy. With its all-natural ingredients including herb black cohosh, a long-time favourite of native American Indians, who first spread awareness of its benefits to Europe. After the 1950s, its effectiveness became known throughout the Western World. Today, it is most commonly used to alleviate female-specific symptoms such as hormonal imbalance, oestrogen dominance, premenstrual syndrome and menstruation issues. 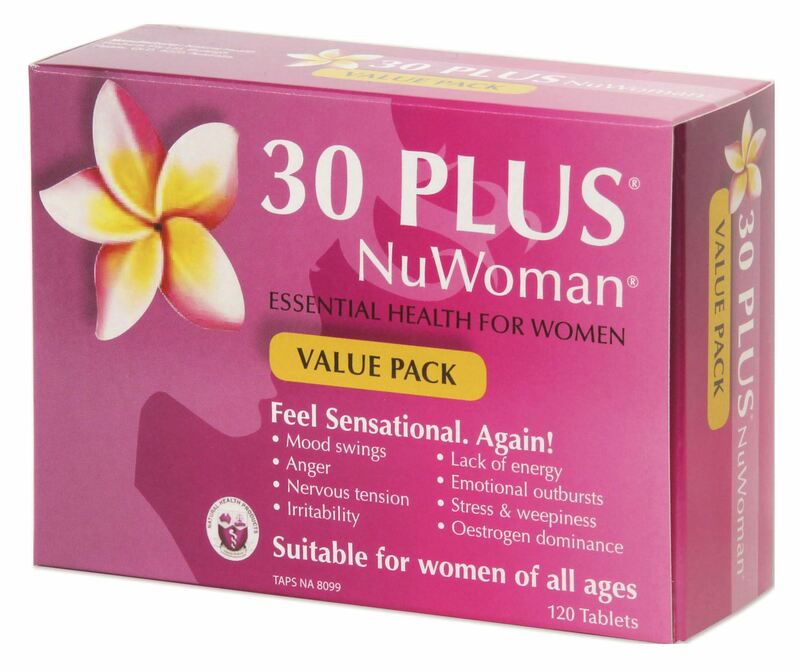 30 Plus® NuWoman® uses a standardised extract of Black Cohosh from the USA known for its safety and efficacy. Vitamins B6, B9 and B12 which may help clear oestrogen through the liver and help to balance hormones. So effective is 30 Plus® NuWoman® that its ingredient profile has remained unchanged since it was first formulated more than 15 years ago. Women around the world have reported overwhelmingly positive outcomes from taking the supplement for the recommended minimum 12 weeks. 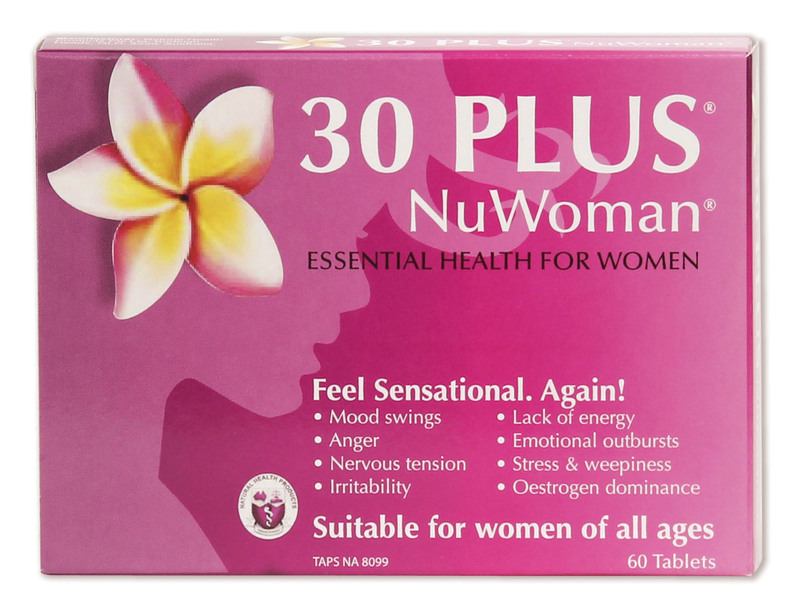 30 Plus® NuWoman® does not interact with the contraceptive pill, and in many cases can help deal with the hormonal imbalance caused by it. Health and fitness coach, Makaia Carr of Motivate Me NZ says 30 Plus® NuWoman® has become her secret weapon to help balance "all those erratic emotions we experience when day-to-day life gets on top of us". "A feeling of calm and peace comes over me and it makes dealing with everything so much easier—and most of all, I become a much better person to be around," Makaia says. "The time for them to work varies for everyone, but these are def my go to supplement when I start feeling like everything is falling down around me... instead of adding extra stress to an already stressful environment, these help me stay calm and work my way through everything that still needs to be done." 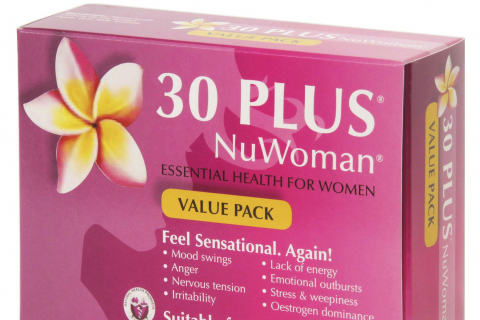 30 Plus® NuWoman® should be taken for a minimum of three months before assessing its effectiveness. New Zealand: Available in pharmacies, health food stores and selected Countdown supermarkets. Contraindications: Do not take 30 Plus® NuWoman® if you are pregnant, breastfeeding or suffer from an overactive thyroid condition. Consult your healthcare practitioner if you are taking prescription anti-depressant medication. Giveaway opportunities may be available upon request. • Supplements to add to your beauty routine. 30 Plus® NuWoman® is a scientifically formulated women’s health supplement that has helped thousands of women since 2003. It was originally developed for Australian Olympic swimming champion, Lisa Curry Kenny, who suffered with oestrogen dominance. A leading naturopath spent more than two years adjusting the formulae and concentrations of active ingredients to create 30 Plus® NuWoman®. Lisa Curry Kenny was in her early thirties and hence the name. However, 30 Plus® NuWoman® can be used by women of all ages. 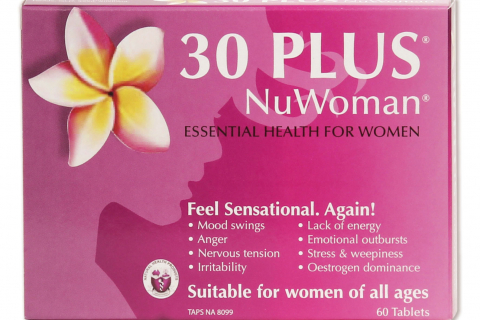 30 Plus® NuWoman® is the number one natural hormonal balance support brand in New Zealand and is suitable for women of all ages. Women need to maintain hormonal balance to ensure good health and a feeling of wellbeing. When the two major female hormones, oestrogen and progesterone, become imbalanced, symptoms such as mood swings, anxiety, stress, weepiness, uncontrolled anger, irritability, emotional outbursts, sugar cravings, lack of energy, sleep issues and loss of personal identity can result. Results have shown women traditionally notice a change after taking 30 Plus® NuWoman® for between two to 12 weeks, however, everyone is different. Disclaimer: Use only as directed and consult your healthcare professional if symptoms persist. Vitamins can only be of assistance if the dietary vitamin intake is inadequate. Unfortunately 30 Plus NuWoman is not a miracle cure, and does not work for everyone. This is due to the fact that everyone is different. We recommend trialing the product for three months to assess whether it works for you.